Fans of baseball history would cover more than just 568 miles with a summer drive from Rochester (NY) to Indianapolis. Rochester's Red Wings (b. 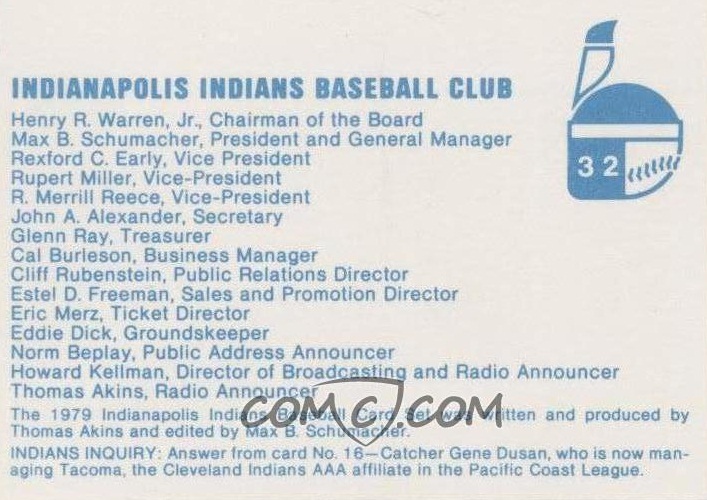 1899) and the Indianapolis Indians (b. 1902) are MiLB's oldest continuously operating franchises, with modern stadiums and big-league affiliations expected to keep both streaks intact into the foreseeable future. 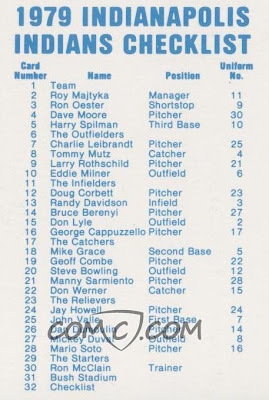 Indy's the AAA affiliate for Pittsburgh today, but fielded future Reds in 1979. 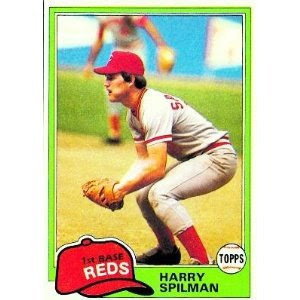 My strongest collector memory of Harry Spilman is 1981 Topps #94, complete with first base glove, the same position I played in little league. 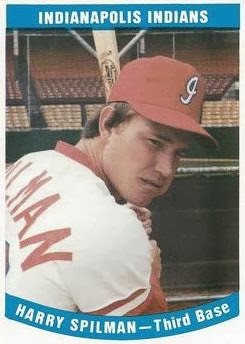 Spilman's positional versatility (1B, 3B, C) and lefty hitting helped keep him in the bigs for more than a decade, sharing plate appearances as a starter (446) and pinch-hitter (460) equally (career splits). 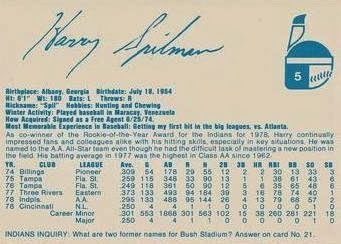 While not a protypical power guy, Harry slugged almost 100 points higher with runners in scoring position, something managers remember, even if anecdotally. Harry's hobbies are hunting and chewing? First time I've seen chewing described as a "hobby," but that's one prominent wad in Spilman's cheek. Today, Indy plays in a modern Victory Field and--according to Wikipedia--multiple sources consider it the minors' best place to catch game. 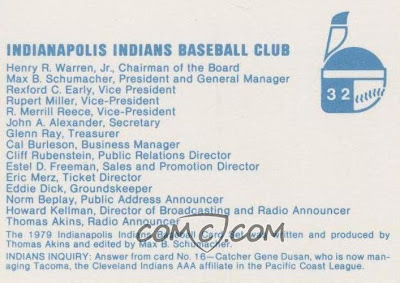 The 32-card Indy checklist includes individual players and several group shots. Most pictured reached the majors, including Mr. Spilman. The best-known might be Mario Soto and Jay Howell. Value: CheckOutMyCards asks $4.25 for this #5. It's the only single listing I've seen, so might be worth it. As of writing, you can get the whole set on eBay for $25. After seeing the "hunting and chewing" mention, I looked at his nickname and somehow read it as "Spit," which I guess is just as appropriate as "Spil"
Yeah, assume Mr. Spilman got called "Spit" on more than one occasion!